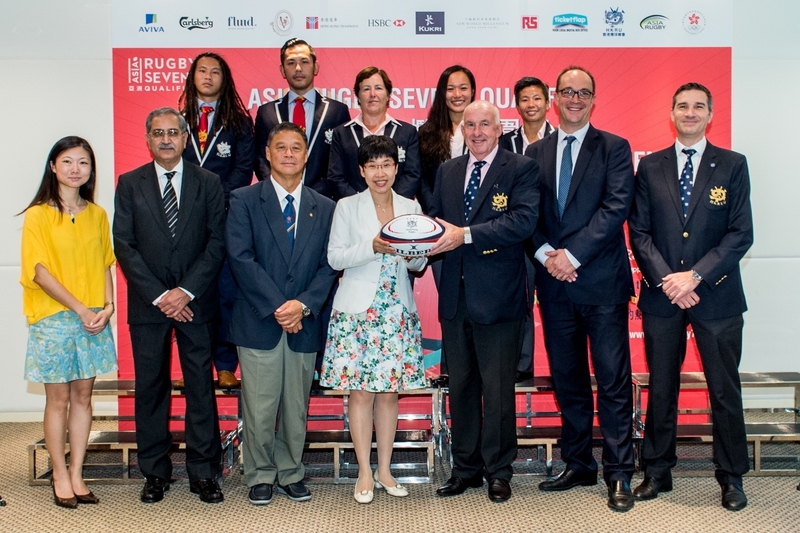 The draw for the Asia Rugby Sevens Qualifier and the Asia Rugby Women's Sevens Qualifier for the debut of Rugby Sevens at the Olympic Games was held by the Hong Kong Rugby Union in Hong Kong this afternoon. The Asia Rugby Sevens Qualifiers will be held in Hong Kong on 7-8 November to decide which nation will take the single available slot for Asia in each of the Men's and Women's competitions at next year's Olympic Games in Rio de Janeiro. At today's announcement of the pools for the event, the Men's Rugby Sevens team was drawn in Pool B and will face Sri Lanka, Malaysia, the Philippines and Iran in pool play. Should the Hong Kong team finish on top of their pool, they will most likely avoid playing Japan, their greatest rivals on the Asian Rugby Sevens circuit, until the Final. The Hong Kong Women's Rugby Sevens team face a more challenging route to a possible place at the Olympics, having to face Asia's other powerhouse teams China and Japan. The Women's road to Rio is played over two legs, with the second weekend of action taking place in Japan later next month. This afternoon's draw was attended by local officials and sporting elite, including HKSAR Government Principal Assistant Secretary for Home Affairs Ms Petty Lai; Deputy Secretary of the Sports Federation and Hong Kong Olympic Games Selection Committee Chairman Mr Ronnie Wong; Hong Kong Rugby Union Chief Executive Mr Vern Reid; and HSBC Global Head of Sponsorship and Events Mr Giles Morgan; Mr Sarinder Dillon, 1964 Olympic Games Hong Kong Hockey Representative; Mr Case Everaert – HKRU Director of Youth; Ms Jennifer Luk, Sales and Marketing Director of Grevino. "We want to make sure that everybody knows that, even though it's November, we have two days of extremely competitive Rugby Sevens coming up, and the Hong Kong teams, which both have a good chance of coming out of this with the right result, need all our support," said HKRU's Vern Reid. The draw was also attended by former Hong Kong Olympian Mr Sarinder Dillon. Mr Dillon represented the city at the 1964 Tokyo Olympic Games as a member of the Men's Field Hockey team. 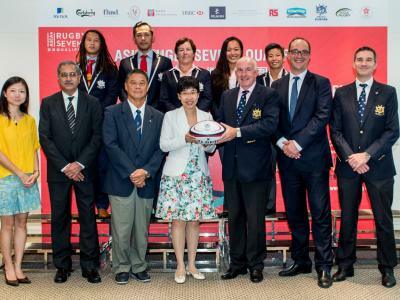 Rugby Sevens will debut at the 2016 Summer Games in Brazil, creating an opportunity for Hong Kong's Men's and Women's Rugby Sevens teams to make history by becoming the first local teams to qualify for an Olympic Games since those heroes in 1964. "As high-energy team sports, rugby and hockey share many values," said Mr Dillon. "Teammates spend so much time together, training and playing, and form close, trusting relationships that are essential ingredients to winning." "To compete at the Olympic Games is the aspiration of every athlete. My own experience is unforgettable. I was only 17, and to be among the world's very best in all sports was simply marvellous," Mr Dillon continued. "Public support is extremely important if our teams are to progress. I take this opportunity to urge the Hong Kong public to get behind our men and women in this wonderful chance for Hong Kong to once again compete in a team sport at the Olympics," Mr Dillon concluded. Today's draw gives the Men's Rugby Sevens team the best possible shot at making the Olympic Games and achieving a once-in-a-lifetime opportunity to compete against the best in the world. In the recently concluded Asia Rugby Sevens Series, Japan and South Korea finished first and third. As Hong Kong's closest rivals on the circuit this year, these two teams are the greatest challenge for the home side. Hong Kong's pool, Pool B, is relatively more open, with the home team showing recent good form against each of the nations it will compete against. 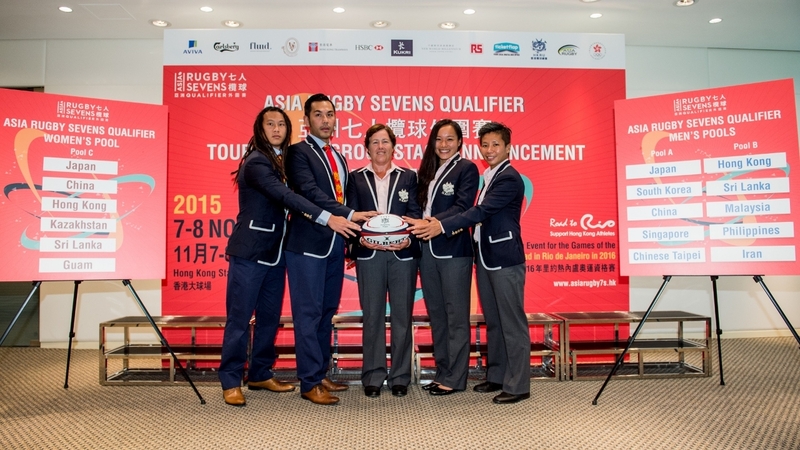 Andy Yuen, a former star representative for the Hong Kong Men's Rugby Sevens Team, was pleased with the Men's draw. "Our pool looks to be the easier one, and so the first day will be a good chance to build up our momentum. If we win the group then we get the best deal in the semi-final and hopefully be through to the big match at the end, likely against Japan, South Korea or China," Yuen said. The Head Coach of the Hong Kong Women's Rugby Sevens team, Anna Richards, says the team has a "tough" qualifying tournament ahead. "We had great success up in Qingdao, where we won in the first leg of the Asia Rugby Women's Sevens Series," Richards said. "We've got a tough qualifier. It's very close between the top four in Asia; Japan, China, Hong Kong and Kazakhstan. Anything can happen on the day. It's not an ideal situation but it is what it is." A former representative player for the New Zealand Black Ferns, Richards played in five World Cups and was an inaugural entrant into the Hall of Fame. The captain of the Hong Kong Women's Rugby Sevens team, Christy Cheng, reflected the team's buoyant mood, after beating Japan, China and Kazakhstan earlier this year. "Of course we can continue this winning streak. After winning in Qingdao, the girls' confidence is high that they can win this qualifier," said Cheng. One standout player set to return for Hong Kong is Royce Chan, who said her shoulder injury is mending "faster than expected". "I'm already doing contact training and will hopefully be playing in the Qualifier," Chan said. The two-day tournament at the Hong Kong Stadium in So Kon Po will feature ten men's and six women's teams in an electrifying competition over the weekend of 7-8 November. But it wouldn't be a Hong Kong Rugby Sevens event without spectacular entertainment off the field. "Olympic Avenue" will line the Stadium concourses during the event to promote the city's sports stars and its sporting community. Spectators will have the opportunity to meet some of the city's most promising young athletes, to interact with sportsmen and sportswomen of all ages, to learn more about Hong Kong's sports organisations and to rally around Hong Kong's Olympians. The North Stand of the Hong Kong Stadium will be transformed into the Rugby Sevens party zone – a destination for lovers of live music. Across the entire weekend, spectators will enjoy a pulsating schedule of bands, DJs and dancing groups – all with roots in Hong Kong. Alongside the Hong Kong red of local supporters will be a colourful tribute to the next hosts of the Olympic Games as sensational Brazilian dancers spice up the proceedings with the sparkle of Mardi Gras. Throughout the weekend, the Stadium's quality catering will be enhanced by specialty outlets providing delicious fare for an Asian Food Festival. And for the littlest Hong Kong supporters, a specialty Kids Zone will offer free face painting, games booths, dancing and singing performances, and the chance to take a selfie with Wai Bei, the HKRU's dragon mascot. Tickets for the Hong Kong Rugby Union's Asia Rugby Sevens Qualifiers on 7-8 November are available online from Ticketflap. To ensure all of Hong Kong gets behind the teams, the HKRU has priced tickets to make the event inclusive for the entire community. Adult prices begin at HK$200* for a single-day ticket and a two-day package pass is HK$360*. Entry for children under the age of 12 is free of charge, although parents are reminded to register their child at Ticketflap to receive a complimentary ticket. The HKRU has announced a 20% discount on ticket purchases for club supporters who enter a special referral code. Each club has the option of passing on the discount to its players, supporters and officials, or use the discount to raise funds. Corporate guests can enjoy admission, entry to the Executive Level of the stadium, as well as food and beverage options, from HK$550* for a single-day pass. * A HK$10 booking fee will we be charged.